The latest news in the U.S.-China tug-of-war over a bankrupt advanced battery maker’s assets and IP. It’s official: Johnson Controls has filed an appeal to the bankruptcy court sale that saw it lose its bid for A123’s assets to Chinese auto equipment giant Wanxiang. But it’s not demanding to stop the sale -- though it stands ready to take over the bankrupt lithium-ion battery maker if politics gets in the way of Wanxiang’s takeover of the company. That’s the gist of a Monday announcement from Johnson Controls, which said it has filed an appeal in U.S. Bankruptcy Court in Delaware to get back a $5.5 million breakup fee it had given the court to participate in the bid for A123’s business. Johnson Controls, which had sought to acquire A123’s automotive assets out of bankruptcy for $125 million, but bowed out of the auction after a final bid of $251 million jointly with Japan’s NEC, about $5 million short of what Wanxiang has pledged to pay. U.S. Bankruptcy Judge Kevin Carey put that $5.5 million in escrow last week, after being told by attorneys representing unsecured creditors that JCI had been lobbying in Congress to have Wanxiang’s bid blocked. But Monday’s statement from Alex Molinaroli, president of Johnson Controls Power Solutions, said that it’s appealing the sale in order to get back that money. The company also made it clear that it considers the sale of A123 to a foreign company a national security issue -- and that it stands ready to buy A123 if the sale to Wanxiang is blocked: “Johnson Controls has consistently maintained that national security questions tied to the core technology used in all of A123's businesses represent a risk to the sale which cannot be dismissed until resolved by the government review process.” If Wanxiang’s bid ends up being blocked, “Johnson Controls remains open to considering future opportunities to acquire relevant portions of A123's assets,” Molinaroli said. Wanxiang has already given up a lot in its $256.6 million winning bid to take over bankrupt U.S. battery maker A123. Not only has it said goodbye to A123’s U.S. government work, it has lost the remaining $120 million or so of a $249 million Department of Energy grant that’s helped build A123’s lithium-ion factories in Michigan -- plants that Wanxiang says it will keep open. But political opponents of A123’s sale to a Chinese company are saying that may not be enough. Even A123’s commercial technology is inextricably linked back to its federally funded work with partners like DOE and the Department of Defense, they say. That could allow Wanxiang to develop military applications based on A123’s U.S.-funded technology, it is claimed -- and that’s enough reason to block the sale. These are some of the issues facing the Committee on Foreign Investment in the U.S. The committee chaired by Treasury Secretary Tim Geithner is in charge of deciding just what parts of a proposed sale of A123’s assets and intellectual property might constitute a national security risk. This week, the group began a 45-day review of the sale, with a deadline of January 15, 2013 to make a decision. The Strategic Materials Advisory Council, an industry group, said this week that dozens of members of Congress have weighed in against Wanxiang’s takeover. U.S. Rep. Bill Huizenga (R.-Mich.), representing the state with the most to gain or lose from the future of A123’s U.S.-based manufacturing, took to Facebook to call it a threat to national security and economic competitiveness. Members of Congress have already been demanding investigations into A123 and key business partner Fisker Automotive, along with other DOE-backed companies that have gone under (Abound Solar, Beacon Power) in the wake of Solyndra’s bankruptcy. Of course, DOE has also given money to foreign companies to create U.S. jobs, with mixed success -- LG Chem, which took a $151 million DOE award for its Michigan factory that builds batteries for the Chevy Volt, furloughed 200 workers in September. As for A123’s military work, it was sold to Illinois-based Navitas Systems for $2.25 million, ensuring that Wanxiang would not take over federal contracts for projects like portable power systems and unmanned vehicles. Wanxiang gets the remainder of the Waltham, Mass-based company’s assets, including its automotive business with customers like Fisker, General Motors, BMW, Tata Motors and Smith Electric Vehicles, and its grid storage business, with partners including AES Energy Storage, Sempra Energy and NSTAR. Just how many of those customers will remain with A123 through its transition remains to be seen. GM, which has tapped A123 to build batteries for its Spark EV, has remained mum on whether it will continue to work with the company as it goes through bankruptcy. Fisker, which accounted for 26 percent of A123’s revenues at the time of its bankruptcy, is facing its own challenges. On the grid-scale energy storage front, AES, which accounted for 24 percent of A123’s revenues at the time of its bankruptcy, last week announced a new battery partner, Mitsubishi-GS Yuasa, for a 20-megawatt lithium-ion energy storage project in Chile. 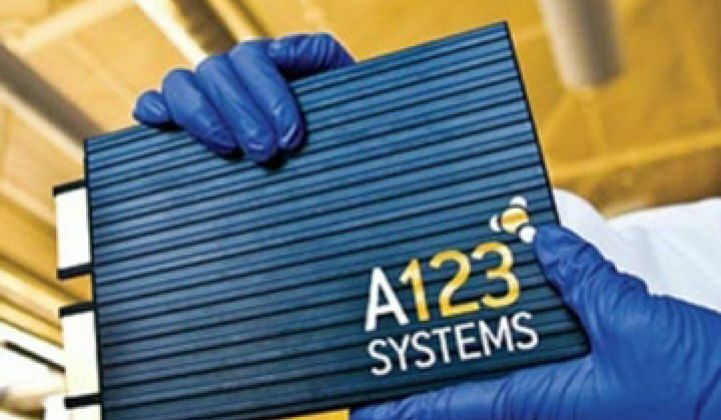 AES Energy Storage President Chris Shelton said in an interview this week that the choice of a new partner wasn’t related to A123’s bankruptcy, and that AES envisions working with a post-reorganization A123, as well as many other battery partners in the future. He wouldn’t say whether or not A123 had competed for the latest bid.